After a long flight, you’re faced with a horrible problem, its next to impossible to watch the latest episode of your favourite British TV shows abroad, oh no! But not to worry, Travel Dave is here to the rescue. After a number of years armed with a laptop and no TV, I’ve often faced this problem all around the world. I’ve had to face the fear of not being able to watch all the British shows that everyone is going on about over Facebook and Twitter. You don’t have to be left out anymore as there is a solution to solve this problem. So let me first explain how it works and why you can’t access the content in the first place to help you better understand it all. An IP address is a unique address that the LAN/WIFI hotspot you’re currently connected to will have. This tells the website you’re using to stream your content, what country you are currently in. Every IP has a fixed location. • You’re in United Arab Emirates and can’t access Twitter. • You’re in mainland China and Facebook is blocked. 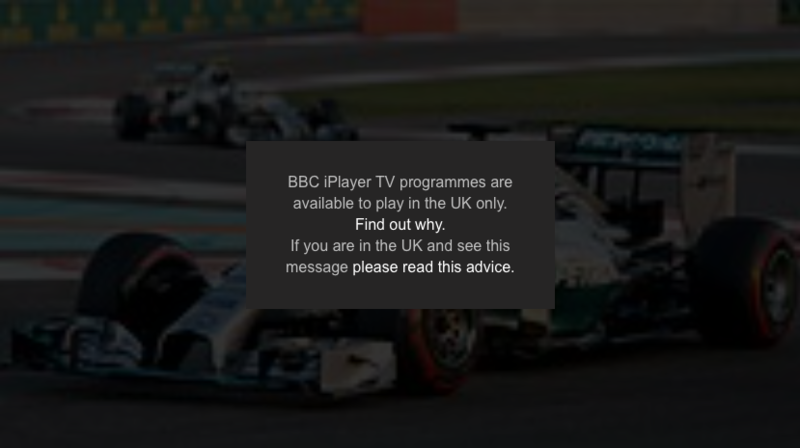 • You want to stream BBC iPlayer in the USA and it’s blocked. Very common situations that travellers face. But you can create A unique VPN which links your internet and computer to a server in the UK, USA or a number of other multiple countries from anywhere in the world. This tricks the website you’re streaming from to think your in the country that you set up the VPN to connect too. So Even though you’re in Iceland, your computer will now say your in the UK, Magic! Some countries: Twitter, Facebook, YouTube, Skype. Some UK websites are also blocked overseas: like the national lottery or T-Mobile to top up your phone. As you can see its not just handy for streaming Online content, you never know what you might need it for on the road. When using a VPN service you’re never left in the dark, you always have access to the content you need from your home country. Easiest way to set up a VPN? There are lots of ways to do it for free. To be honest it can get rather technical if you’re not very tech savy. That’s why I use Tunnel Bear. 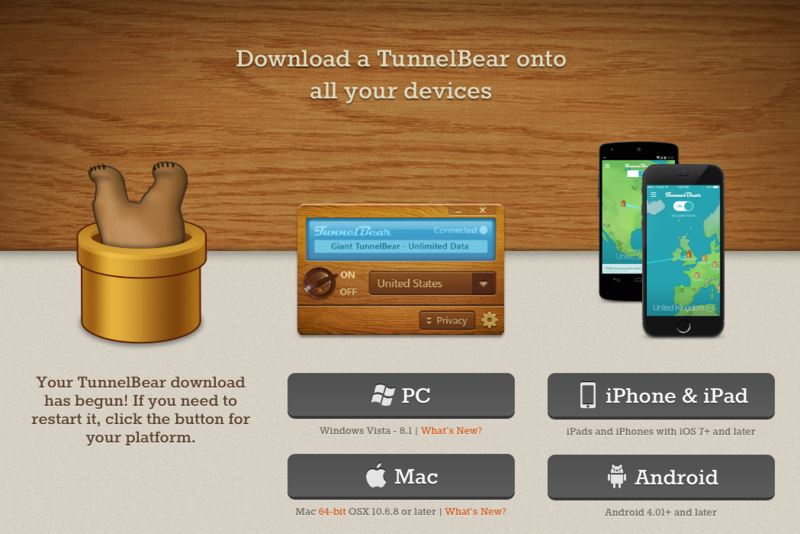 I was happy to discover Tunnel Bear as it’s simple to use for both, PC & Apple MAC as well as portable devices such as an iPhone, iPad or on Android. They even have an app to make it easier to use on mobile devices, how handy! Best of all its free. When you sign up you get 500MB a month of free use (enough for a couple of tv shows). You can also follow a link and Tweet a message to gain an extra free 1GB a month, which for many might just give you enough for what you exactly need on your vacation. If like me, you live abroad and want to use this service more frequently, then there is a monthly or yearly subscription service. It currently at this time of writing works out roughly £29.99 ($49.99US) for a whole year, Bargain! Spread this out monthly and you’re only paying a little under £2.50 a month, not much for what you get, unlimited streaming overseas! It’s a very small price to pay if you use it every day like I do. 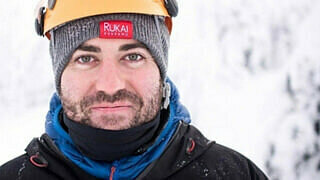 The yearly package is called the Grizzly , Check it out. I’ve used free alternatives and they do work, but Tunnelbear just gives you that piece of mind without having to be technical. It’s extremely easy to use too, You can turn Tunnel Bear on and off with the app and it quietly sits on your desktop bar and activates with one simple click, it just works. This is great if you happen to watch Sporting events in other countries such as the Olympic commentary or the Superbowl, as well as popular streaming sites in the US such as Hulu. I recently had to Watch the Eurovision with Dutch commentary, but by using Tunnel Bear I was able to watch it on the BBC which for me makes it more special. 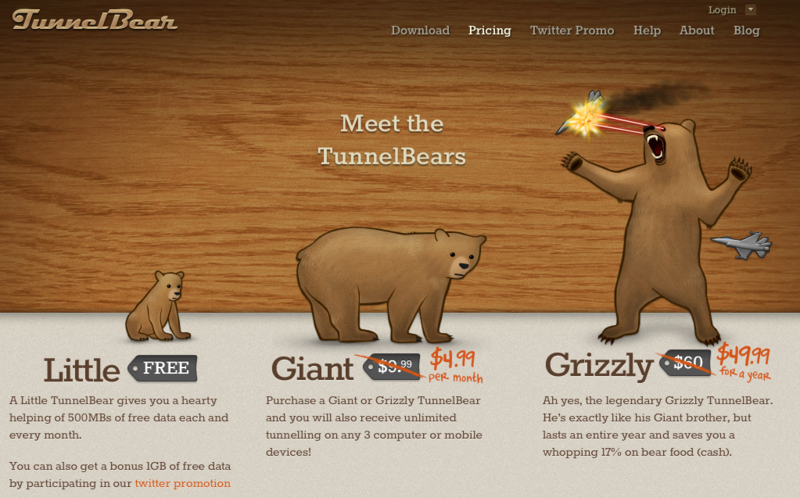 Just a note, I’m not being endorsed by Tunnel Bear in any way its the service which I use and enjoy using. So there you have it, you can access Twitter in UAE, check your Facebook in China and watch your favourite British TV shows in the US. Disclamer: Many countries have laws restricting these type of activities, so make sure you’re following the guidelines where you are to avoid landing into any trouble.